Our New Granddaugher Has Arrived! 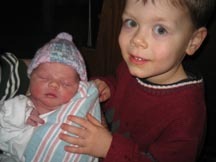 Here is Gianna Kathryn Brown held by her big brother, 4-year old Dominic. Giana is our second granddaughter and our sixth grandchild. Our daughter Cindy did a great job and both are very happy and healthy. She was 8 lbs. 1 oz. They just came home this afternoon. For more pictures and the story, visit my photo album here, Cindy's Kodak EasyShare, and my son Jesse's blog here. 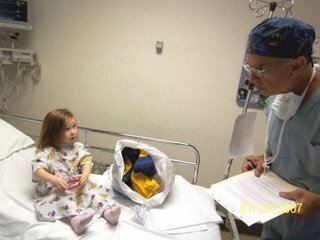 And here is our granddaughter Maria Faustina Ray at the hospital to have her tonsils removed. She did great and within a few hours was ready to go home but she decided she wanted to spend the afternoon with us — Nanna and Pappa! For more pictures and the whole story, visit Jesse's blog here. For the story of our two oldest grandsons' birthday party (born within four hours of each other), click here. Next post: If you live in snow country . . .